India has been perhaps my most intimating destination yet. I had heard a wealth of mixed reviews from friends and bloggers alike - many love it, some hate it, but most of the feedback I encountered was a blend of the two. After having paid the country a brief visit, I can certainly see how both perspectives can easily coexist. 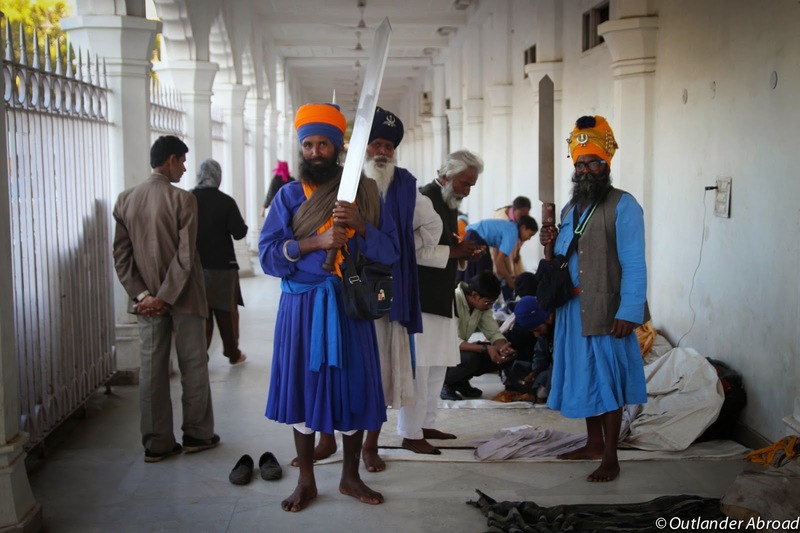 India as I experienced it was first and foremost a land of striking contrasts. The architecture is absolutely stunning, and the people are some of the most beautiful on earth. Everything is bursting with color, from the gardens to intricate details on beloved monuments, from the delicate fabrics of the women's saris to the powder being flung in every direction during the annual Holi festival. 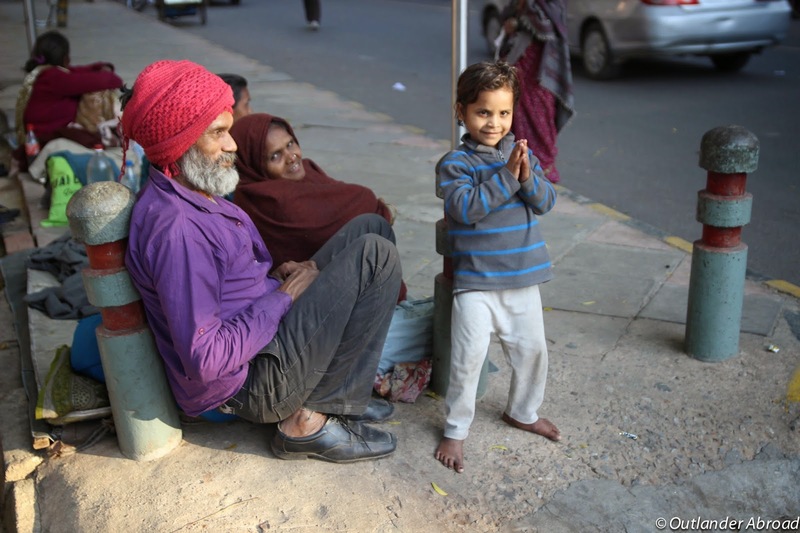 But India is also a place with some of the most devastating poverty I've ever witnessed. 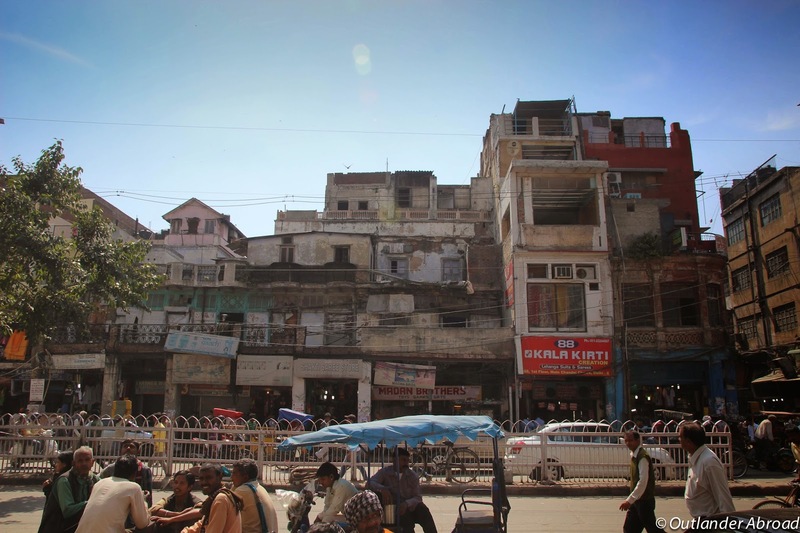 There are piles of garbage everywhere, and there's no hesitation on the part of most residents to urinate or even defecate wherever they please. Walking along the street, you might see a monument of incredible architectural beauty, with beggar women holding barebottomed babies out front; perhaps a set of ramshackle houses constructed of tarps and wood and garbage sacks, with satellite dishes perched on top; or you might in the same instant be hit with the whiff of rank sewage and the warm, sweet scent of spices. 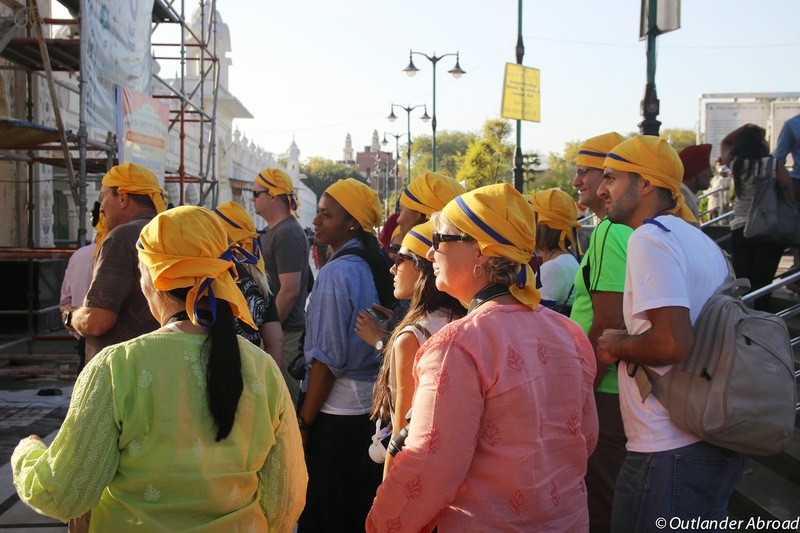 I decided to book a tour with Bohemian Tours in advance to visit India primarily because prior to my departure I was incredibly intimated by the general chaos of getting from place to place and the safety aspect of being a woman traveling alone in such an unfamiliar culture, where I would definitely stand out. While there were some major pros and cons associated with that decision, in the end, I'm glad to have made it. However, since I did travel with a tour, the amount of sites we visited and activities we covered in the span of less than two weeks is somewhat mind-boggling. 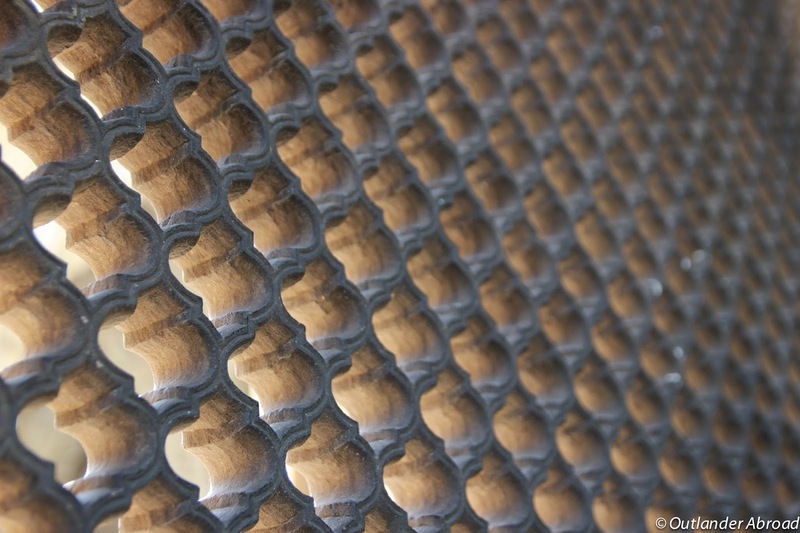 Rather than recap in detail everywhere that I saw, I would rather let my pictures do most of the talking. 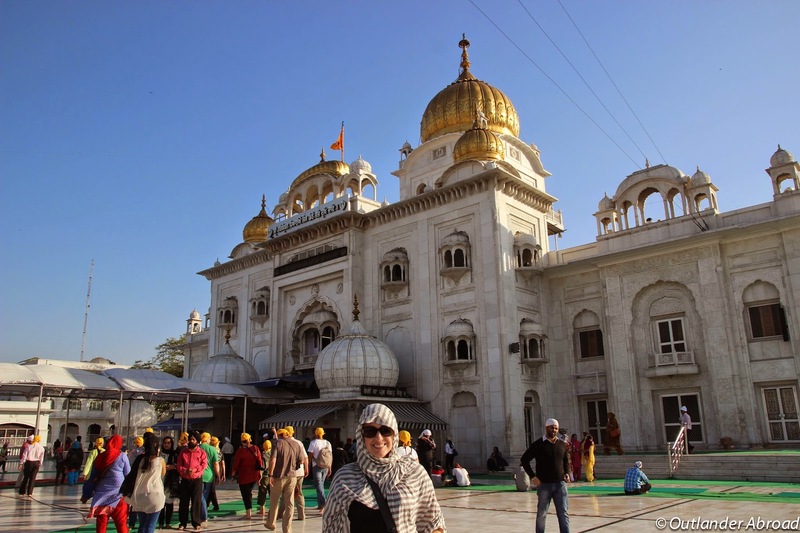 For this first entry, I'll focus on Delhi, where we started our journey with an optional add-on day tour of the old city. 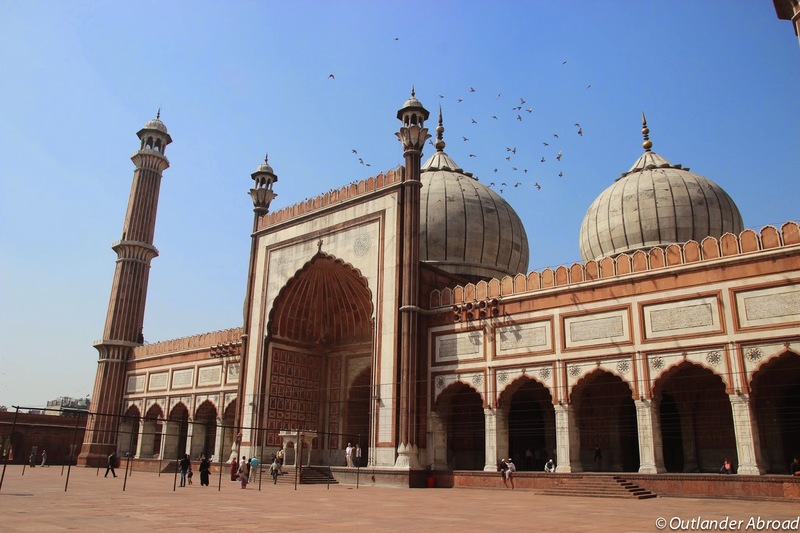 Our very first stop on the tour of Delhi was the Shahi Jama Masijd, also called the Friday Mosque, a brilliant red structure of sandstone built by Mughal Emporer Shajahan in 1656, and the largest mosque in India. A common theme… these schoolboys asked to have their photo taken, then wanted a photo with me. I was very conscious to ask the locals if I could take their portrait, as I noticed plenty of people taking not-so-discreet photos of me with their phones. 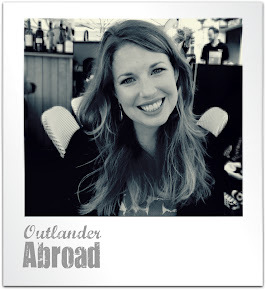 Being a tall, blondish solo female westerner is a bit of an oddity around here, and the men are not shy. 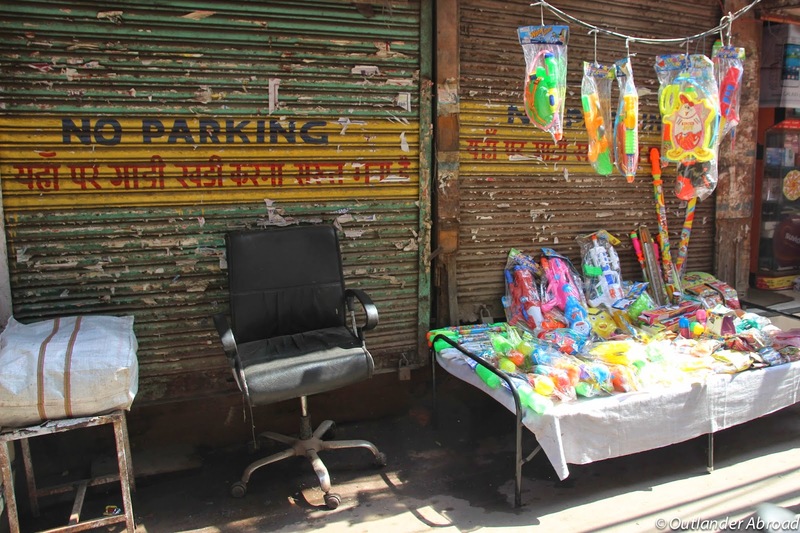 Walking through the streets of Old Delhi, we passed dozens of shops and stands selling everything from fabric and trinkets to street food and water guns for the upcoming Holi Festival. Rather than use blinkers, every vehicle in India uses a horn to indicate… pretty much everything. As a result, the background noise in almost every city is a constant chorus of honking. 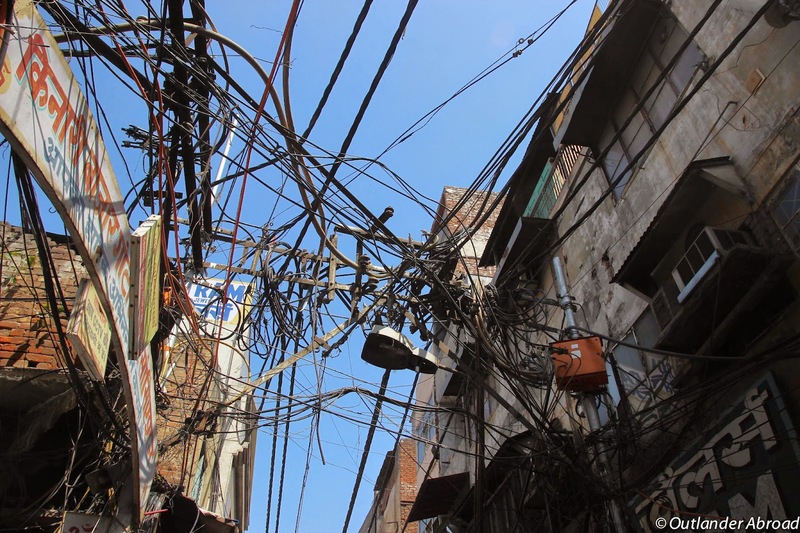 The streets of India: tangled wires, buildings, and traffic patterns. 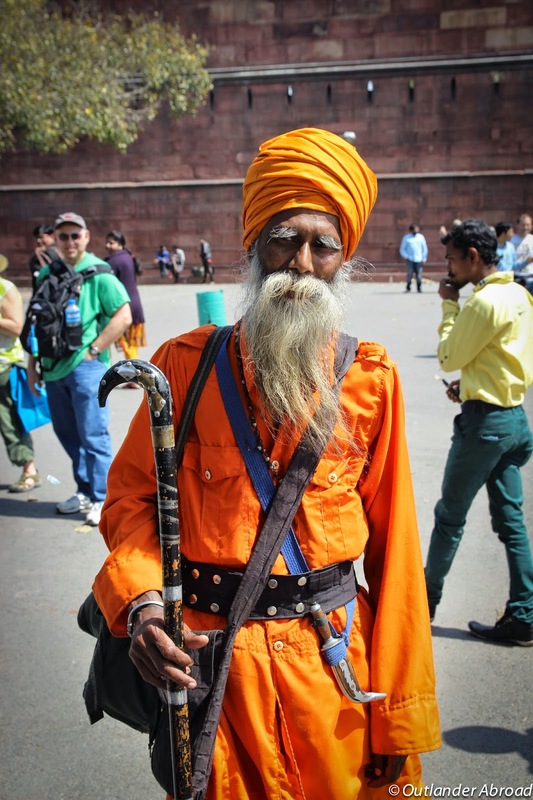 A sikh man in brilliant orange robes outside the Red Fort. He happily posed for photos from a number of people in our group, smiling widely when we showed him the results. 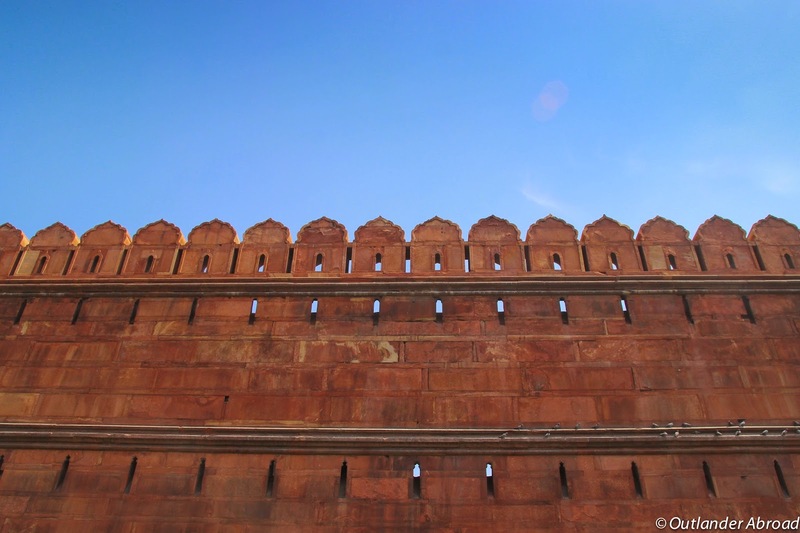 Geometric patterns at Delhi's Red Fort. 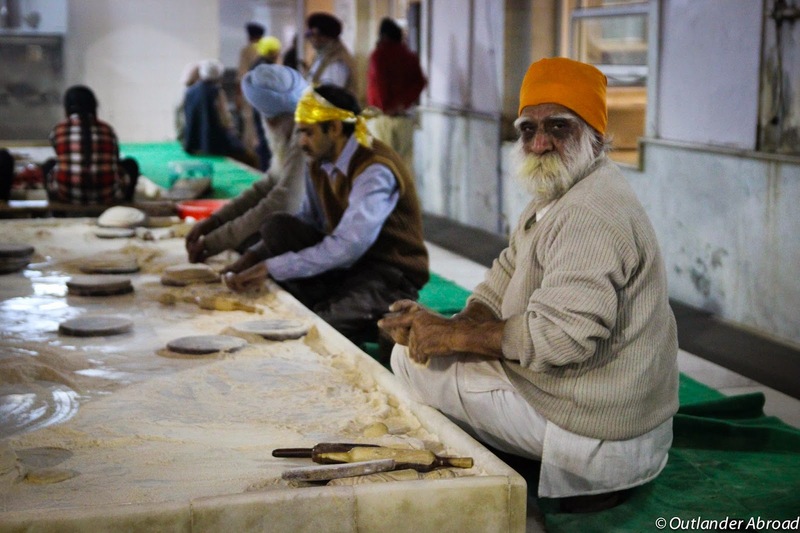 A visit to a Sikh Temple in Delhi, where we covered our heads, removed our shoes, and took a peek inside the kitchen where they prepare meals for the community. A child on the street stood in this pose shouting "namaste!" to us as we passed, his family members smiling behind him.